An audited study showed that if a Life Alert member goes to a retirement home, it will be 5 years later than an equivalent aged senior. 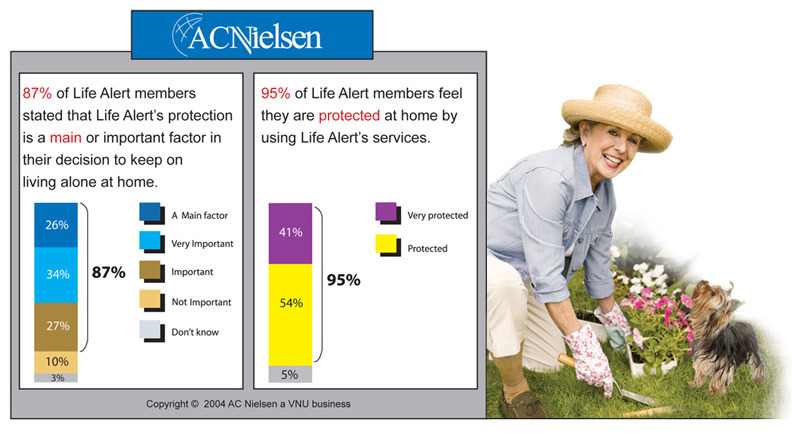 In a survey conducted by ACNielsen Research, 87% of Life Alert ® members said that Life Alert's ® protection is a main or important factor in their decision to keep living at home rather than going to a retirement facility. If Life Alert ® protection could enhance your quality of life, and later replace or delay going to a retirement facility, wouldn't you be interested in a FREE informational brochure? Call 1-800-360-0329.